Tripp Lite USB to RJ45 Cisco Serial Rollover Cable, USB Type-A to RJ45 M/M, 6 ft. 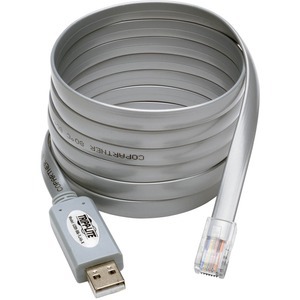 The U209-006-RJ45-X USB to RJ45 Cisco Serial Rollover Cable is designed for consumers and IT professionals who want to connect their computer or laptop's USB port to their Cisco® modem, router, firewall, switch or other serial-based Cisco device with a console port. Convenient six-foot cable eliminates the need for additional cables or adapters. Install the drivers using the included CD, then attach the RJ45 plug to your Cisco device and the USB plug to your computer for a direct connection (Note: If your computer has no CD drive, the drivers are available online for you to download). No external power is required. Works with older and new Cisco models. Supports data transfer rates up to 250 Kbps, as well as remote wake-up and power management. Premium double shielding eliminates crosstalk and reduces EMI/RFI line noise that could negatively affect your transfer speeds and data. Compatible with Windows®, Mac® and Linux.